Light and fluid, COSLYS Organic Cleansing Lotion removes makeup and impurities of normal and combination skins. Its pleasant texture is enriched with soothing macadamia oil and protecting lily extract. After using Coslys Organic Makeup Remover, your skin is clean, fresh and smooth ! Je l'utilise au quotidien, et fonctionne plutôt bien dans mon cas ! 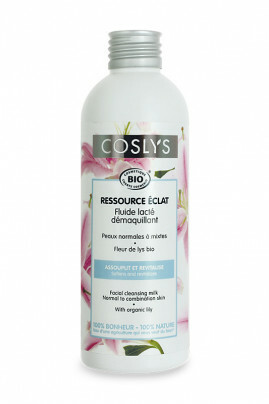 Apply day and night Coslys Organic Makeup Remover using a cotton pad all over your face. Wipe the excess with Coslys Toner. Organic and natural ingredients for a silky soft skin ! Aqua (water), caprylic/capric triglyceride (emolliant from coconut and vegetal glycerin), spiraea ulmaria flower extract* (organic meadowsweet floral water), prunus armeniaca kernel oil* (organic apricot kernel oil), macadamia ternifolia seed oil* (organic macadamia oil), glyceryl stearate citrate (emulsifier from coconut and palm kernel), glycerin (vegetal glycerin), lilium hybrid flower extract (lily extract), lilium candidum flower extract* (organic lily extract), polyglyceryl-3 stearate (vegetal emulsifier), butyrospermum parkii (shea) butter*, xanthan gum (thickener), hydrogenated lecithin (vegetal emulsifier), chondrus crispus (carrageenan) (thickener), aloe barbadensis leaf juice powder* (organic aloe vera extract), parfum (100% natural fragrance), benzyl alcohol (conservative), dehydroacetic acid (conservative), potassium hydroxide (pH regulator), tocopherol (natural vitamin E), glycine soja (soybean) oil (non OGM soybean), citric acid (pH regulator), potassium sorbate (conservative), sodium benzoate (conservative), linalool, limonene, citral, geraniol, citronellol (components naturally present in the fragrance).